Complete the casual comfort of your bedding with this bright and fluffy comforter. The double-stitched comforter is crafted from soft, smooth microfiber that is available in a variety of trendy colors, and features a hypoallergenic down alternative fill for a snuggly loft. Large box stitching adds style and texture to the design, while keeping the fill in place for evenly dispersed, medium warmth. I love love love this comforter! It's the perfect weight for us Southern gals. Not too hot and not too cold. Just right, like the Three Bears! Ha-ha. Seriously, you won't be disappointed with this product. The microfiber is so soft and I bought the king size for my queen bed for more coverage because of my large mattress. Buy it - you won't be disappointed. The Double-stitched Microfiber Hypoallergenic Down Alternative Comforter has held up very well. It is a nice weight and keeps a person warm. I have had this for over 4 years now. I got the king-sized one for a queen bed and it is just right. Maybe a bit small for king-sized beds. The comforter is soft and not too heavy but very warm. Makes us very comfortable even in a room with older/drafty aluminum windows during winter. I realized that the same comforter is also available in a set with pillow shams. I might have got that if I knew earlier. Washes and dries easily. It doesn't get very creased out of the dryer and the few creases go away quickly once spread on the bed. Would definitely recommend this comforter. I got the navy blue one and the color is nice. Purchased a king size for a queen bed so it hangs more like a bedspread. It comes to about 5-6 inches on each side. The foot of the comforter covers the mattress but not as long as the sides. That's OK with me though. I got this in navy and the color is exactly as pictured on my computer. The outside cover has a soft, almost silky feel to it and the fill is thicker than I imagined and is well dispersed. I have not washed it so I hope it stays that way. It is providing just the right amount of warmth on our cold desert nights here in SoCal when the temps drop into the 20s or less. Very pleased and do recommend.. It's held up for a few years now. But it's really too light for what I'm looking for. We live in Southern Cali and it doesn't keep kids warm at night b/c the twin size is too thin. Not enough fill, in my opinion and should be labeled as a lightweight comforter. Buying a larger comforter with much more fill. Make sure to check out the ounces of fill so it's warm enough for you. It stayed together pretty well...no problems with stitching or washing LOTS of times. I love this comforter. I wish it hung over my king bed a little bit more on the sides but I do love it. The price is right on point due to the sides not being long enough...maybe they sent me the wrong size? It hangs over about 3 inches or so on each side for King The stitched squares keep the filling in place. It is very warm and the fabric is a nice stiff sheet like Cotton feel. I’ve had it for a month and it was washed right out of the bag and still feels brand new. It washes well in an oversized modern washer. It was a tight fit for the king in my huge washing machine. 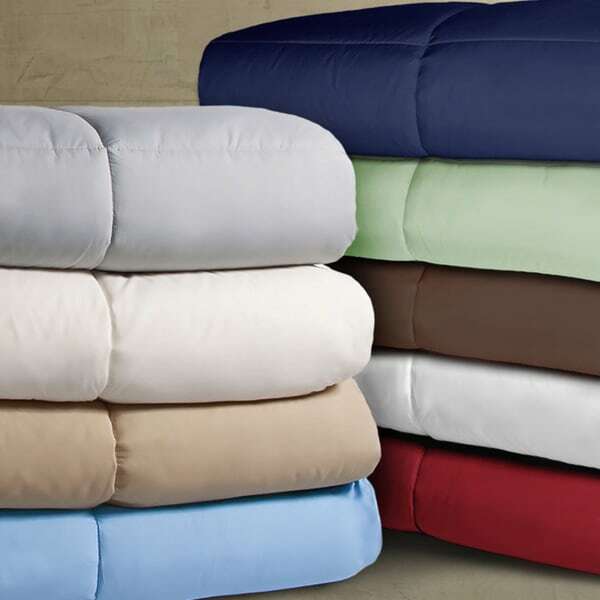 Double-stitched Microfiber Hypoallergenic Down Alternative Comforter is exactly what we needed. The red is beautiful I have washed it 3 times already no problems with it, stitching is great. We thought about using an open sleeping bag for cold evenings no need with this comforter. So pretty I could even use it as an alternate bedspread if I want to! I am perplexed by the title that led me to believe this comforter and another I bought in another color are double stitched. The are NOT double-stitched. The thread stitch is also large, so an experienced seamstress, I suspect these will begin to show wear after a few launderings. Where is the double-stitching? These are piping edged but NOT double stitched. .I would return them but it is too much hassle. I ordered two of these comforters in sage and navy and both came quickly with colors as advertised. They machine washed well and are very soft. Keep in mind they are a very light comforter so you will want to add an under blanket if your house gets below sixty five. Four stars because I attempted to pull off the tag with one on the and tore a one inch hole in the stitching. I will mend it but it did indicate the quality of the stitching to be not so great. I was worried when I had to give up my down comforter, due to allergies, but this comforter is just as warm and cozy. I added a duvet cover on top to protect the comforter, but even without a cover it is soft and fluffy. I'm thinking about getting another for my guest room! I bought two of these comforters in navy blue for my boys bunk bed. I got both the single and double size. They are soft and warm and fit our needs perfectly. When you have two typically destructive boys you don't want to spend a fortune on furniture or bedding, so the price was right too. These blankets have held up well so far. They aren't too bulky, fit nicely on their bunk beds and keep the boys warm in the winter. I expect they will be perfect for summer as well. This comforter smells like plastic even after 4 washings. That is the one good thing about it is that a king sized comforter will fit in a regular machine since it's thin. (which IS what I wanted). But the material is slick and slippery. If you sit on the edge of the bed you just might slide off. Smells very plastic and toxic-ish. I don't recommend it at all. Save your money. I was very happy with this comforter when I first opened it and put it on the bed last week. However, last night my seven year old granddaughter slept at my house and got sick during the middle of the night on the new comforter. I immediately washed it in cold water on gentle. When I took it out of the washing machine it looked awful. All of the filling on the inside looked like large lumps and the stitching had drawn up. This comforter looks awful. Like I said, it looks great until you wash it, and then you will not want it on your bed anymore. Terrible quality. Thank goodness I haven't opened the other one. I am returning them both. This blanket is SO SOFT!!! We love it and it fits our king size bed just right. It was a great price compared to the other blankets we were looking at. It's not too heavy and it's not too light, it's perfect. Lightweight, very nice comforter for my guest room. Perfect match with other accessories. Chocolate brown is true to description of color. Do not have anything negative to say about this comforter and was also very happy to be able to purchase a comforter without the shams and pillows, etc. Perfect item for me!! Thank you, Overstock.com again! This was the perfect choice for us, I ordered the king size comforter to cover a queen size bed with some extra room to spare. Color was just what I needed to match the room, comforter is soft to touch and warm enough for winter use in the basement bedroom. Would consider ordering again in another color for other rooms. Great material love the color I chose. I have purchased from other stores and the material was not as advertised very poorly made. I love shopping at Overstock all their products are exactly as advertised and the craftsmanship is great sturdy wash after wash.
Love these blankets! They are super comfortable and perfect for a hypoallergenic down alternative comforter! The colors are great (bought more than one color) and they hold up very well! This is the perfect weight and just the right amount of warmth! I love it and want to order one for every bed in the house! "I only own real down blankets and throws and they are amazingly warm! Are the alternative down throws as effective in keeping you warm?" This will look and feel about the same in look but will not be as warm as down comforter. "Is the red tomato red like the larger photo or crimson like the stacked photo?" The correct color is brick, not red. We apologize for the confusion. More tomato than crimson I would say. "What's the weather range for this comforter and can it be used as a duvet insert?" I live in Michigan and it gets quite cold. This comforter will do the trick. It is rather heavy but very warm. "Measurements are listed for a Twin XL size, but I don't see any Twin XL sizes offered. Do you carry that size? Thank you!" This may sound strange, but I have all sizes of beds, including twin,full,queen, and king. They usually are to short on the sides no matter what size you buy. I found a little trick that always works for me. I turn the comforter or quilt sideways, and you have plenty to work with. Yes, we carry the twin XL but all colors are out of stock at this time. It doesn't say that it is but since it is 100% polyester, I would so no. "is this comforter available with matching pillows and a sham? If so what is the style number. Thanks"
Unfortunately no,matching pillows are not available. "Is this brown a warm milk chocolate brown or dark chocolate?" I'd label it as dark chocolate.